Part of that is driven by a December 1 deadline to submit the college’s materials for national accreditation. The college has paid its $25,000 application fee to the Liaison Committee on Medical Education and the American Association of Medical Colleges lists WSU among its membership. That means, even though the college isn’t yet teaching students, it is considered part of the medical school fraternity. Another part of the accelerated process is due to the energy and involvement of the College of Medicine’s new founding dean. That dean, John Tomkowiak (tom-KOVE-ee-ack), M.D., formerly of the Chicago Medical School, is officially on the job, part time—one week in Spokane, one week in Chicago—until the end of the year. As of this writing he has been dean for two weeks and has already held dozens of meetings with his new faculty and staff, as well as with community and health care leaders in each of the cities where the new college will have clinical campuses: Spokane, Tri-Cities, Vancouver and Everett. 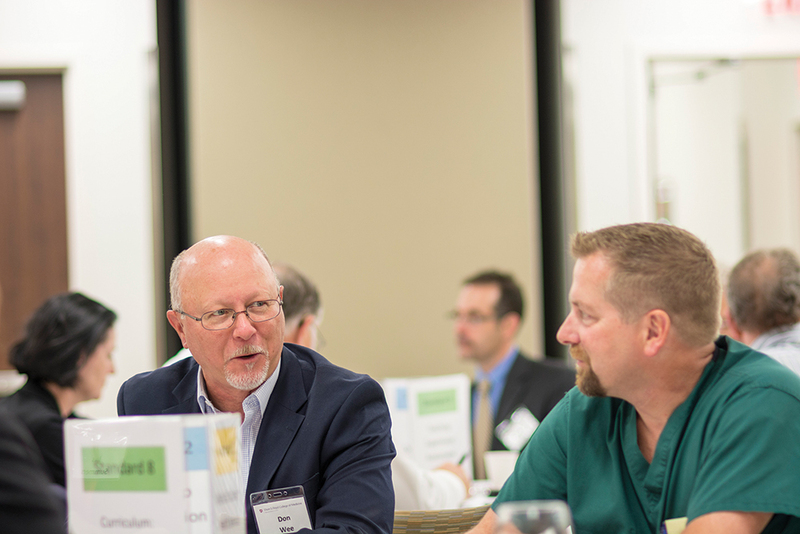 Don Wee (left), administrator for Tri-State Hospital in Clarkston, chats with Dr. Mark Mulholland (right), an OB/GYN doctor in the Tri-Cities, at the Tri-Cities self-study meeting. 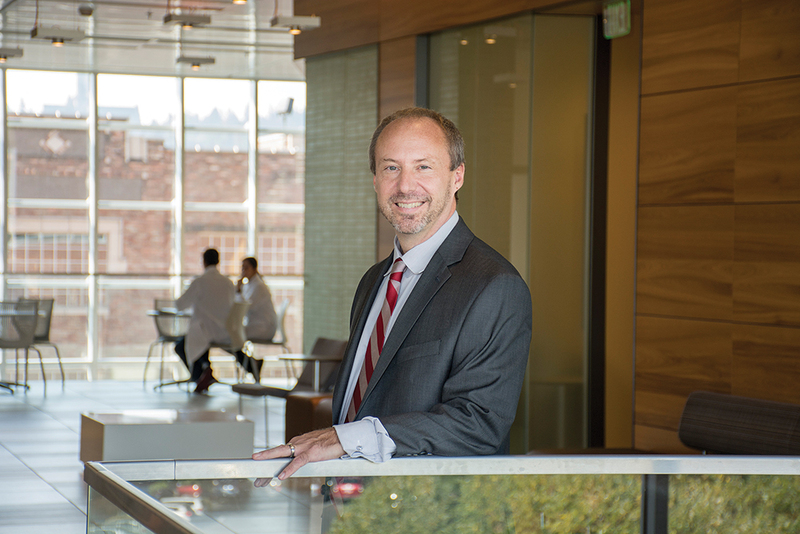 Tomkowiak has adopted one of President Floyd’s mantras, that WSU’s medical school will serve the entire state. That message of statewide inclusion served the university well as Floyd and his team worked for months to build support among legislators for a WSU medical school. With votes from representatives and senators representing every region of the state, including Seattle, the WSU medical school bill passed by overwhelming margins in both chambers. Governor Jay Inslee signed it into law on April 1. Cameras captured photos of an ailing, but smiling President Floyd shaking the governor’s hand following the ceremony. It was one of the most significant days in the university’s 125-year history and marked the crowning achievement in Floyd’s eight-year tenure as president. In September, the Board of Regents rewarded the president’s work by naming the new medical school the Elson S. Floyd College of Medicine. During the same meeting, Interim President Dan Bernardo announced Tomkowiak’s appointment as founding dean. Much of Tomkowiak’s agenda for the new college reinforces what Floyd had envisioned: training physicians, especially primary care, in rural and underserved areas; developing a pipeline of students from those underserved groups who are more likely to return as physicians to their home regions; and improving the health of people statewide. But Tomkowiak, who is also a licensed psychiatrist, has brought some ideas of his own. During his second week in Spokane, he stood onstage in an auditorium on the WSU Spokane campus to preside over his second meeting with College of Medicine faculty and staff. He talked about building a culture of innovation in his new workplace and then he introduced a guest speaker: Andrew Richards, founder and chief technology officer of Reel DX. Richards talked about the myriad of companies, including his, that are developing new technologies that give patients more options for accessing health care. He says some patients are using smart phone apps for video appointments with their doctors; sometimes those doctors are in other cities —or other countries. He showed a photo of Mercy Virtual Hospital, a new, first-of-its-kind hospital in suburban St. Louis that cost $54 million but has no beds. It is a telemedicine hub where doctors and nurses sit in call centers with video screens. They see and talk to their patients, have access to their medical records and can monitor vital signs. In many cases, the providers are able to diagnose problems and prescribe remedies. In others, they make referrals to other providers. Richards’ presentation spawned an interesting discussion about how the new technologies are expanding and changing medicine. Physician faculty members expressed their concerns about the quality of care offered during virtual appointments and the legal and ethical questions raised by the new technologies. system. Then he reiterated his desire to develop a culture of discovery and entrepreneurship within the College of Medicine. “I want all of us, students, staff, faculty, administration and our partners, to be thinking ‘How can we make things better? How can we innovate? How can we build? How can we invest not only in ourselves, but in the state of Washington,’” Tomkowiak said. During his short time as dean, Tomkowiak has introduced new concepts he considers to be innovative for American medical schools. 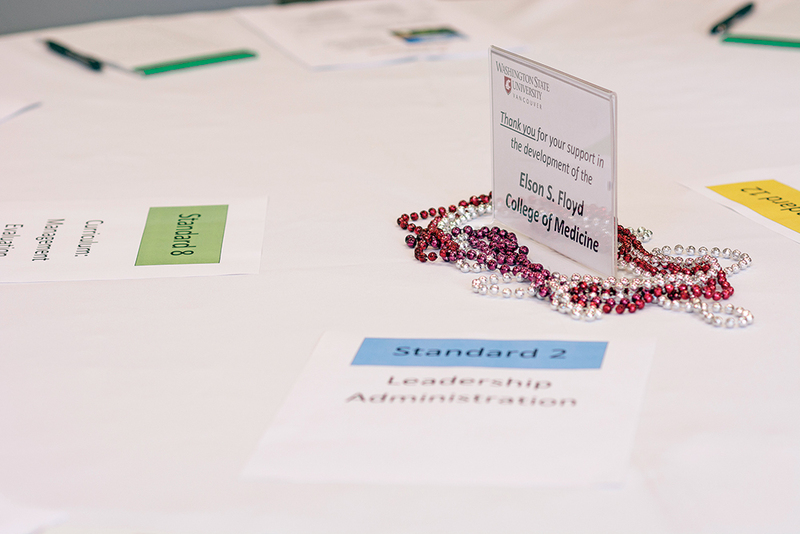 For example, he proposes WSU medical students take a series of courses in leadership to prepare them for those roles, whether it be in their hospitals, clinics or communities. It’s a curriculum that he says is not done to this extent in any other allopathic American medical school. His suggestion has been greeted warmly by top administrators of the Everett Clinic, one of the college’s new clinical partners. They say their company spends a huge amount of money each year to teach leadership skills to their employees. Tomkowiak has also floated the idea of allowing students more control over the pace and order in which they take their courses. He says the well-established medical education system has set artificial limits that dictate when students take their classes and how much time they spend on them. Those limits often have no real relevance to students, he said. “I can’t show you whether a self-paced system will work because no medical school is doing it like we’ve envisioned it,” Tomkowiak told his faculty and staff. “This is our chance to lead and demonstrate that this is a better way to educate the physician of the future. I’m not saying we’ll do this, but I’d like you to consider it.